Charlie Beddows aged 21 from Birmingham. Charlie is an apprentice at the University Hospitals Birmingham NHS Trust. The Trust employs over 9,000 staff and is the largest single site hospital in the country. Charlie, who attended the Starfish course in 2016, was nominated by fellow employees for an award and was chosen from the whole of the trust employees for the Brighter Futures award. We are very proud of how hard Charlie has worked to control his stammer and congratulate him on winning this great award. My dad first attended the Starfish course back in 2003 when I was 17. I'd always known my dad to stammer so, as a child, I didn't really notice it...it was part of him. However, as I grew up, I started to understand what a struggle it was for him and how this affected his confidence. Me and my sister would try to help him but the only way we knew how was to speak for him. If he needed anything from a shop, we would go in; if we went out for a meal, we would order the food and if he needed to make an important phone call, we would do all the talking (after dad had struggled for several minutes answering security questions then passing the phone back to me or my sister). It was upsetting seeing him struggling with something the rest of us take for granted. When he told me about the Starfish Project, it almost seemed too good to be true. I obviously hoped that it would help him but I could never have imagined the transformation after just 2-3 days. I remember my dad calling me from the course and speaking to me without a single stammer. He sounded like a different person, he was "chatty" and "confident", words that I would never have used to describe my dad. I was absolutely over the moon and so proud of him. I can only imagine the relief and happiness he must have felt. After struggling for all of his life, he was able to approach a stranger in the street and ask them for the time...such a huge achievement!! Since then, my dad has regularly attended the course as a refresher, which has helped him to continue using the technique, whilst supporting newcomers. I have heard such wonderful things about his Starfish family and I'd like to thank every one of them that has supported him. Recently, my dad took me out on his motorbike around the coast roads. We stopped off at a couple of places, the first being a small cafe in Cromer where we had a cup of tea...we then went on to Hunstanton and had a fish and chip lunch in the restaurant. It was a beautiful day but, what I took for granted was, my dad ordered our drinks, he then ordered our food in the restaurant, he was looking at people and smiling and he went to the counter to pay for our meal. It made me think back to when I was younger and how I used to do all these things...now he can do them without hesitation and I didn't need to speak at all. Also, he was showing confidence, looking around at people...my dad used to be shy and quiet. I'm so very proud of my dad, for how far he has come since 2003, for his perseverance, his strong mind and will power. He is such a different person to who he used to be and the changes in him are all positive. I would like to apologize to my dad as I don't always appreciate how hard it has been and I will never truly understand, but he has done so well to keep this up for over 13 years and he should be extremely proud of himself. Finally, I would like to say how very grateful I am to The Starfish Project for changing my dad's life, and helping him become the person he is today. I know my dad thinks a lot of his Starfish family and the support and encouragement they give each other is overwhelming and inspiring. Well done Starfish...keep changing lives!! I am so thankful every day, when I look at my eldest son, Jack, and see his eyes light up as I watch him laugh and chat away about the things that thrill him... or scowl and complain about the things that don't. I remind myself when he is being argumentative, that having a healthy argument and putting your own point of view across is something, which in most cases, is easily taken for granted-but not by me. You see, I know what it's like, as a parent, to have a child who can't express themselves fully. I know what it's like to have a child who avoids certain situations that might involve a conversation and I know what it's like to have a child who doesn't feel very good about themselves; through no fault of their own. I also know of the pain, as a parent, at not being able to take away that discomfort and distress. Finding 'The Starfish Project' changed my son's life forever. He has the most wonderful, independent and happy future ahead of him now as he is free (for the vast majority of the time) from the shackles of not wanting to speak. In fact, now at 17, things are quite the opposite for him, as he loves to talk. So what did he learn? Well, he learnt many things in just the first three days-and in a loving and supportive atmosphere. Perhaps, most importantly of all, he truly learnt to love and embrace himself as he is and not worry about what some folk adversely have to say about him ...and that if anyone has a problem with the way that he speaks, well then, it's very definitely their problem and not his. Importantly in tandem with that, however, he learnt how to control his stammer instead of his stammer being in control of him. Gone from his world, now, is the self-doubt of humiliation if he opens his mouth to speak and he can't get his words out. Welcomed into his world is a technique to confident speech. 'The Starfish Project' put my son in control over his stammer. Click here to watch us share our story on ITV's 'This Morning' programme. Whether you're a new student or a refresher, I believe that we are all on the same journey as we aim to control our stammer. Most journeys have a starting and a finishing point. However until there is a cure for stammering our journey only has a starting point. I like to think of our journey as a journey on the famous M25 motorway that circumnavigates London. You can join the M25 at any junction you like, and when you do it doesn't matter what time of day or night there's always other people on the motorway. Although you?re sharing your journey with others, only you know how far you've already had to come to reach this point. I like to think of learning the Starfish technique as being taught how to drive, and using the technique like driving a car. Whilst learning to drive everyone is taught the same basic principles, then everyone develops their own driving style which works for them. Some people may drive fast, whilst others travel along at a much slower speed. It doesn't matter how fast you go, as long as you keep moving forward you'll end up further along in your journey. Only you will know what your ideal speed is. How often have you been driving along at a reasonable speed, only for someone to overtake you and disappear into the distance. Then a few miles down the road there's a traffic jam and look who's sitting in front of you, the same car who flew past you earlier on !! During your journey there may be times when you feel you are flying, such as at the top of the Dartford bridge when you can see for miles around. Other times you may find yourself in a dark place, such as the Dartford tunnel. This can be a pretty scary place for some people however if you keep moving forward pretty soon ahead of you, you will see the first rays of light at the end of the tunnel, which as you go on will get more and more until you are out in the open again. As we know travelling on the M25 is almost never without incident, even on the shortest of journeys you can never be to sure of what is around the next corner waiting to affect your journey. People get into trouble on motorways when they go too fast, lose concentration or stop moving forward. If you find yourself needing help whilst on your journey, on the side of the road there?s always a telephone not too far away. Where you can speak to someone who will be able to offer your assistance and get you back on your journey. This letter is long overdue but finally I am able to put pen to paper and just say a few words. I cannot remember a time in my life when I have not stammered. Like all stammerers I look back at my childhood and remember very upsetting situations not only at school but also growing up generally trying to communicate with friends and family. One of the strongest memories was the feeling of isolation and the belief that I was the only person in the world who had a stammer and as I grew up in a small sea side town I did not meet anyone else with the same difficulty. Speech therapy helped but it was not on-going and there was a distinct lack of additional support, I had to accept my lot and get on with it. I will never forget watching Channel 5 when the Starfish Project was first brought to my attention and the feeling of relief that such an organisation existed. After a long wait I was booked in to go on the November 2007 course. My life has changed so much since then. Ok, I'm still the same man but I now have so much confidence. I can never put into words how grateful I am to you both and all the refreshers who helped me get to where I am now. At age six my parents were keen that I join Cub Scouts. I refused as I had a hard enough time at school with the stammer and didn't want to open myself to more aggravation. My mother arranged for me to see a speech therapist. That was over forty years ago. In secondary school I did not put my hand up to answer a question once in five years. I don't recall speaking much at all. Age 12 to age 22 was like 'the lost decade'. Speech therapists came and went as did the Edinburgh masker, syllabic speech and the metronome, hypnotherapy and a variety of residential courses; some had an effect some did not. One course reduced me to inconsolable tears. I would have been in my early twenties at the time. I put up a barrier to make sure that didn't happen again. Late in 2008 I was introduced to Starfish and had firsthand experience of the effectiveness of the course. 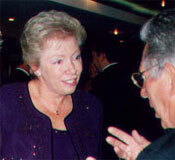 I contacted Anne in December 2008 asking about a place on the May 2009 course as indicated on the Starfish website. She told me there had been someone drop out of the January 2009 course and would I like that place. I took it. Post Starfish has been a revelation. I had never come to terms with being a Stammerer. The word made me curl up at the edges with embarrassment and inexpressible anger. I can very happily be a 'Recovering Stammerer' I used to do lots of impressions different accents. I now don't like doing this as I have found my voice; I don't need to be anyone else. I have found me. There are some parts of me I am still discovering. I like this. The strength of the Starfish course is that one comes off of it as a Recovering Stammerer. One is not cured. There is no cure. The beauty of the Starfish technique is that it is so simple. It just works. There are support groups around the country that meet regularly and you can return as a refresher any time free of charge. Thus far I have attended as a refresher twice and have learned new stuff both times. I was introduced to the Starfish Project via the website in 2003. Having done some speech therapy and some research into different techniques to control/cure stammers, I was aware of what was out there, including the McGuire Programme which impressed me but was cautious of, and various speaking devices which did not seem at all natural to me. I finally completed the application for Starfish and attended the course in February 2004. Although I found it helpful, it did find using the technique very difficult and until early 2008, had not really immersed my psyche into using the technique to best effect. There was a support group in Nottingham which I attended, although sometimes grudgingly I admit, but knowing it was good for my speech. No one is judged or criticized on Starfish even if one is struggling, helpful support is given, no-one ever says you haven't been working on your speech have you? So during these few years, I struggled on with the technique, but there remained a barrier within me that often prevented me using it in front of others. All of this was to change in February 2008 when I had a job interview for a post I had been interested in for a while. I knew most of the people on the interview panel (it was for a post in the same organisation) and although I prepared what I was going to say, I did not prepare how I would say it. In addition, I was very nervous. Nervousness and lack of preparation can hardly lead to a positive outcome. Predictably, at the interview, my speech was very poor, quite out of control. The experience affected me deeply but fortunately I was booked to return on the Starfish course the following week. The course helped me move on mentally and I vowed to myself at that time that I would never allow anything like that to happen again. From then on, I fully used the Starfish support system by regularly returning on courses and practised my speech on the comprehensive telephone list. I also attended the local support group with renewed commitment. In addition, I joined a local speaker's club to increase my confidence in public speaking. During this time, I continued searching for other jobs, as my current one was hardly conductive to a happy and productive working life. In June 2008, I had an interview at the University of Nottingham for a research post in tobacco control. Before the interview, I called two or three people on the support list which really helped me focus on the technique and maintain a confident attitude. At the interview I was nervous but did not let it show (very important in an interview). Although it was a very formal situation, my speech was in control and I appeared confident. I was exhausted afterwards but knew I had done my best. That was the Friday. On the Monday, I received a call from the HR department to offer me the job! At the time of writing, I have been in the job for 16 months and it has exceeded my expectations. By continuing working on my speech and using the support of both Starfish and the local speaker's club, I have been able to break new boundaries with my speech: street interviews with the general public and one to one interviews with professionals have challenges I have faced and conquered, so to speak. They have been great opportunities to extend my comfort zones but it does not stop here. In the coming months I will be delivering seminars for academic staff and with a combination of effort on my part, and support from the Starfish programme and speaker's club, I feel confident I can accomplish these with strong controlled speech. 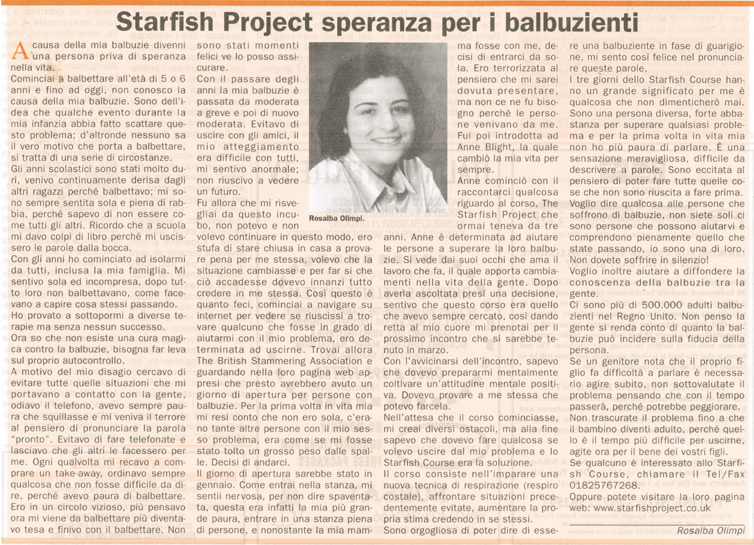 The Starfish project and its life-long support has been instrumental to me in my journey. As far as I'm concerned it is the most positive and effective therapy available, where a challenging technique is taught with great compassion and dedication. One need only attend a course to realise this. It is important to say that not everyone who attends the starfish course for the first time (or even subsequent times as in my case) will have strong speech. This isn't because the course is at fault, but because some of us are simply are not ready at that time to take on board all the aspects of the technique to use in our everyday lives. The first course is the beginning where we learn the technique and get a flavour of what Starfish offers so we can begin to gain control over our speech, and with experience, learning from ups and downs, become what Anne describes as 'our own speech therapist'. The purpose of writing this account is not to say look what I've done but it says you can do it too. All it takes is a little determination and belief; so if you have a stammer and are fed up with being a slave of it, avoiding situations, people and places, then you too can regain control, not only of your speech, but of your life. Your self esteem will improve (generally very low in people who stammer) and you will become a happier and much more confident person. This certainly has been the case with me and for this, I am truly grateful to everyone on the Starfish project, especially Anne Blight, without which the programme would simply not exist. I've stammered all my life (mostly quite severely) and I could write all day about old experiences, problems and frustrations, but that's never really been me, I've always just wanted to do something about it. My decision to attend The Starfish Project will always be one of the best decisions I'll ever make. Those initial 3 days on the course and the 3 years since have been an absolute revelation for me. Saying my name with control; doing a reading at my friend's wedding; choosing a job with lots of speaking having previously chosen jobs with minimal speaking or being told I couldn't do jobs because of my speech; really enjoying using the telephone when it used to be a nightmare for me; speaking on live radio; doing a presentation on stage to a conference audience. All these things I've now done that once seemed totally impossible to me. Just as important are the everyday things that most people take for granted, like asking for a sandwich that I could never say before, ordering a drink at a bar, etc, etc. I could talk all day about how Starfish has helped me but you've got to experience it for yourself to really understand. Before Starfish I generally tried to do things in spite of my speech, but it did hold me back in many ways. The difference now is that I know I can do whatever I set my mind to, whilst putting into practice what I've learnt. It's not a cure but for me It's the thing I''ve always wanted something that is effective, something I have responsibility for, something I can work at. I'm very much my own speech therapist now (with the amazing support of others doing what I'm doing). Probably the biggest thing for me is not just the things I've done, but more the absolute joy of speaking I now have. Like a lot of people I've met who stammer, I love talking. Now I can be myself, express my true self that people never really saw. That's the real joy. I don't really think I've changed, just now people see the real me. On the one hand, I really want to encourage people to attend the course because I know how much it can help them, but on the other, I know that some people (like me) are put off when it all sounds too good to be true. What I would say to that is, It's not easy, because It's not a cure and is something you have to work at, but it is much easier than stammering with no control, and if you're someone who is motivated to gain control of your speech then this can help you more than you can imagine. I guess the only way to find out is to try it yourself. Everyone is there for the same reason, either for the first time (with similar anxieties), or have been on the course before and are coming back to help out and work on their own speech, so everyone knows exactly how you're feeling. The course atmosphere is motivating whilst relaxed and informal. Costal breathing is just speaking on a different kind of breath than we're used to. You learn a technique and an approach to help you in realistic everyday situations. You're not forced to do anything, but the more you put in, the more you get out. You go at your own pace, you focus on yourself, you're treated as an individual. It doesn't matter whether you're an overt stammerer (you stammer openly) or covert stammerer (you hide it) you wouldn't be there if you didn't need to (all this is understood). I've tried numerous speech therapy approaches over the years (psychological and physical) and always given them my best shot. Some helped to an extent, some didn't. To be honest, what I've learnt at Starfish goes way beyond anything I've done before. Before the course, I thought it was just a physical technique I'd be learning and didn't realise that was only one part of an all round approach (bringing together a few things I'd tried before and some I hadn't). I've since met many people who've made great progress with this from doing the job they always dreamed about, to ordering the drink they could never say before. It's all equally important. So after 3 years, I'm writing this as a recommendation, as a thank you, to hopefully lessen some anxieties about attending, and with a sense of pride in what I've achieved so far. I'm excited for the next chapter. I'd like to dedicate this to the finest people I've ever met courageous, progressive, funny, generous people - pushing themselves to change their speech and their lives. Hello my name is Lizzie Waddington...it feels so good to say that. Before coming on Starfish I had not said my name since I was 9! Now I can. I could never find the words to give my everlasting gratitude to both you, Anne and your husband David, all I can do is keep reminding you how much you mean to me and how special you are. I was very sceptical about doing another speech course because they had not worked in the past. I know now that I was so wrong and you should not be so quick to judge! Starfish brings people together whilst teaching them a breathing technique to control their stammer. I have met some of the kindest, nicest people who show deep compassion for everyone in their similar situation and its so lifting to be a part of that, I have a second family. The Starfish Family! This year I watched "This morning" the daytime television show and witnessed a miracle. Trevor Campbell had a stammer but after being on the course he had control and I longed to be normal like that! I said to my mum I wish I could meet him. 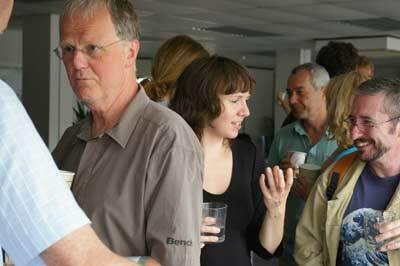 I met Trevor on my first Starfish course in January 2007 and I had the privilege of working with him! He is a lovely man who tells terrible jokes...but hey! He can't be perfect because really no one is PERFECT! One final note...if you have a stammer please come on the Starfish project I would never have believed it when I first went but I am now a very proud recovering stammerer and the bubbly, loud funny Lizzie is here to stay! I thought I would write straight away and tell you how much I enjoyed attending the Starfish course last week. It has already made a big difference to my life. For example this morning I told Jason, who is a salesman in the local Vauxhall garage, that I am a recovering stammerer. The response from him was positive (and in some ways totally unexpected) as he then told me about some panic attacks that he had been having. Another task which I have done this morning was to phone Barclaycard to get them to reset the pass code on my internet account. Just last Tuesday I would have struggled to do either of these without having a racing heart beat, breaking into a sweat and stammering badly. As I said to Hayley last night before I reluctantly left the hotel, I now think that we stammerers are the lucky ones. This might seem like a very strange comment to many stammerers. We will experience total joy and elation at doing normal everyday tasks which 'fluent' people will never experience. This is a complete sea change in attitude for me. My stammer had always controlled me and recently it had got a lot worse. I had even taken to writing my name down on a piece of paper so that when I went to the Doctors I could just show this to the receptionist instead of saying my name. As I said in my final day video, at work I would hide myself away when I had to make a telephone call as if my stammer was a shameful and 'dirty' secret which had to be concealed from everyone else. When I went to the petrol station I would avoid pumps 6 and 7 like the plague and queue up for 10 or 12 even if the others were free. I heard another comment from someone on the course this week. They said "all the people on the course are such nice people". This set me thinking. Perhaps stammerers are generally nice people and this is because their experiences have moulded them to care more for vulnerable people and people with disabilities. I am sure that most stammerers have been teased and mocked because of their affliction. I know that I have. These experiences in many cases have made us more compassionate and more concerned for the problems and needs of others. As I said I enjoyed the course immensely but the final day trip to Eastbourne was especially good. Working with your friend Mary was particularly positive as she pushed me to disclose to as many people as possible that I am "Jonathan Baker and a proud recovering stammerer". I did this in the Perfume shop (opposite Boots), the T-mobile shop, Julian Graves, Clinton Cards and Costa Coffee. Saying this was especially hard in T-mobile and Costa Coffee because I had to attract the attention of the young men in both cases and wait for them to come to me. However in EVERY case the response was so positive I could not believe it. In Costa Coffee for example the man behind the counter beamed a wonderful smile, told me his name and said well done. He and others even shook my hand! Well many thanks again. You are all doing a GREAT job and are without exception very kind and caring people. For most of the drive home yesterday I was choked up with emotion and I cried for some of the way. This course has moved me that much. I can never thank you enough for that. It is now nearly two years since I joined the Starfish "new intake" that Wednesday morning on 24th October 2001 at the Boship Farm Hotel. That day was the start of a new journey for me in ways I had only previously dreamt of. I had stammered all my life (49 years at that point) and came prepared in giving the course my best (maybe in my heart, my last) shot after years of struggle and, at times, downright hopelessness that anything, or anyone, could help. There were a few months wait between when you phoned to say I had a place on the course and when I actually went. I therefore decided to spend the time preparing myself to gain the maximum benefit from the course. I am no expert on therapies but know that acknowledgement of the problem is important. I am an analytical person so my preference was to analyse my stammer. I recorded it while I was on the phone and played it back, I watched myself speak in a mirror while on the phone, I documented its characteristics (good days, bad days, when I stammered most, and how I felt). It was the most difficult thing I have ever done, and do not recommend it for everyone but it served my purpose. I did not share what I had done with anyone, it seemed too painful. although I suspect now it was just embarrassment. I also was aware that therapies always carry the spectre of relapse, the failure of being able sustain any improvement, and the heartbreak that might bring. I was ready though in my own mind. The course was going to be the easy bit in relation to sustaining any improvement in the real world and that was how I was going to approach it. I shan't describe those three days on the course; it is too personal and too difficult to explain the emerging realisation that fluency improvement is possible and in my own hands to achieve, and the wonderful, unconditional support of others present. Nearly two years on the fluency gains are still there and I am becoming adept at managing my own therapy but still treasure, and need, the Starfish support mechanisms, in other words, the people. The kick I get from answering the phone with my name is still there, as is booking a hotel or restaurant, asking for what I want in a shop or bar. All these examples every day make it easy for me to sustain the fluency when the stammer tries to rear its ugly head. In fact being able to ask for what you want, as opposed to what you can say, sums up what Starfish has given me in terms of technical fluency. You have also given me other gifts that I did not imagine. While recovery from stammering has to be primarily a selfish act, the Starfish community by its actions shows it can be done within an environment of caring for each other. From this I have now become more at ease with myself, listen more, understand people more, learn more, and I do small talk! My speaking life now carries less anxiety and embarrassment and this makes me feel good even when I am not speaking. Ironic isn't it, Starfish helps even when you are saying nothing! It has been hard, and remains so at times, but it is worth it for how I now feel, and I want to keep on feeling this way. The underlying principles of the Starfish that you have created and consistently nurture worked for me. You care about the individual, and the time spent by the support network of recovering stammerers is given freely and with great compassion. You have helped so many people and I hope many more will grasp the opportunity that Starfish offers. I'm now a year and a half down the line since my first Starfish course. Most of the time it seems like a lifetime ago, but the smell of DKNY perfume (I wore it on my first course), or listening to Will Young sing Anything is Possible (my friends bought this for me, along with a cake, to say well done), brings it all flooding back to me. Those memories of elation, release and sheer damned happiness, I guess will never fade away. But fade they do, I knew, and said, at the time, that if I could bottle these emotions up I would become a millionaire, I also knew that they couldn't continue as heightened as what they were forever. However, my first Starfish course back in February 2002 did change my life forever and set me off on a journey that I had always dreamt of making. At times, particularly in the early days it was tough. The toughest part of those early days was losing some of the control I came home with. Rather than focusing on the massive improvements I had made (of which friends, family and work mates kept trying to remind me!) I felt frustrated at the blips I was having, sometimes I felt it was slipping away, and that frightened the life out of me. In saying that, never, have I had a day of stammering even close to pre-Starfish. I never had a day of pushing my tongue out of my mouth, and pushing my head back, to get all those B and D (etc, etc, etc) words out. I have never avoided using the phone in my office (I would always use the phone in an empty office, once I'd plucked up the courage to use it) and I certainly have never let anyone order my meals for me. Over the months, I did continue to work at the technique. Not getting it right all the time (and at times still getting frustrated), but never really questioning that it was right for me, because I did realise how far I had come. It was something that I always thought would be tough, but I had to work at it. I learned more and more about such a simple technique, took all the support on offer and spoke to people on the phone list for guidance. I continued to do things that I had never done before. I regained that control that I had lost, and then went on to gain more, and become much more confident with it. Which brings me back to the start. I'm a year and a half down the line and it is much easier than I ever expected it to be. I am not a fluent speaker, and never will be. I am a very proud recovering stammerer, and still working hard at my recovery. Yes, I have worked through some tough times, and I expect more are probably to follow. But the technique, I feel is engrained and has become habitual. I know what I am supposed to do, I know what I expect of myself and I know that I will continue to do this for as long as I live. saying my name. I don't feel 'different' anymore, in fact, I quite like myself now. Those feelings of being a stammerer are fading away, which sometimes frightens me, because I never want to take what I have for granted. No matter what happens in my life, going on the Starfish Project (which I so nearly didn't) will be the best decision I will ever make. That decision changed my future; it has given me choices that I would never have made, experiences that I would never have had, people that I would never have met. Most importantly it has given me a future and a life that I am looking forward to, my future is down to me now, and not my stammer. I can hardly begin to tell everyone how attending the Starfish course has gradually started to change my life. I was very apprehensive about going on the course, I am a covert stammerer and have always managed to hide my stammer from practically everyone in my life. Familiar, I am sure, to all covert stammerers I have got by, changing words in a sentence, frantically thinking ahead whenever I speak for the words I will have problems with and choosing a substitute, sometimes I have blocked on the substitute too and ended mid sentence saying things like you know what I mean and waving my hands around. The alternative, a lot of the time, was to say nothing, get whoever was with me to ask for things in shops, directions etc. I could always feel brave if I had what I wanted to say in writing, somehow that helped me get the words out if I was in a shop and I could always point. The daily frustration of not being able to say what you want to say is something that most fluent people have no idea about. Coming away from situations like the doctors, dentist, interviews, seeing your child's teacher without asking the questions you have in your head, people thinking that you have nothing interesting to say and people feeling embarrassed and sorry for you when you do struggle with a word. Maybe they hadn't but I certainly felt embarrassed and sorry for myself. Not long after that on the BSA website I found information about the Starfish course and e mailed Anne, she emailed me back and asked me to ring her. Surely she knows that stammerers have problems with the phone I thought and she wants me to ring her! I did ring her of course, once I'd made a decision to do something about my stammer I was on a real mission and nothing would stop me. I was worried that being a covert stammerer would mean I may not benefit from the course but she reassured me and I booked a course for July. I was so scared the day I arrived that I was practically the last down to the evening meal, being with a crowd of strangers, having to make conversation, was the stuff of nightmares. I soon realised that we were all there for the same reason and were all sharing similar difficulties with the situation. From the first few hours on the course I knew that this was going to make a difference to my life, for a start I was speaking more in a few days that I had done practically all my life. There were people on the course who were patiently listening to me and waiting for me to speak and helping and encouraging me all the time. Anne's patience, understanding and empathy with all of us was so inspirational, she touched the nerves of everyone, all the hidden tricks I thought only I knew about she was openly talking about. The coughing, the 'ers and ums', the pointing and the apologising were all treated with such openness and sensitivity and humour. I was exhausted and so happy when I finished the course and felt I could conquer the world. It's a long road to travel this recovering from a stammer. The techniques that we learned on the course must be practised all the time. Use the phone list to talk to others to reinforce the techniques as often as you can and share your experiences good and bad so you can carry on learning. I still have times when I resort to the old way of talking because I can get by most of the time, but getting by is all it is, I know that. I don't want that any more. I have some times when I struggle to focus and use the techniques properly but I do know that I can trust the techniques I learned at the Starfish course to help me control my stammer forever. Just to end I have now spoken in front of groups of people several times, the last time it was in front of a hundred people at a business training. I gave a short testimonial and explained that I was controlling my stammer using a breathing technique. I was congratulated so much after that talk and people were saying how brave I was. I don't think I was brave, I just used the techniques I was taught at Starfish, which gave me the confidence to do it. I find that people are now subtly treating me differently, as if they know that I do have something to say after all. Thank you Anne and David and all the wonderful people who I met on the Starfish course and those who I have spoken to since on the phone, I shall be back soon on another course so see you then. If you don't like how things are, change it! You are not a tree. I had always stammered, can't remember a time when I didn't. Over the years I suffered the usual taunts at school and people thinking that I wasn't very bright. Tried NHS speech therapy but didn't find it helpful at all, sometimes I'd actually come out of sessions worse than when I went in. Thought hypnotherapy might do the trick, but after spending in excess of 200 pounds on that, the hypnotherapist actually told me that he couldn't do any more to help me. I tried everything I could think of, Kava Kava, St. John's Wort, drinking, smoking, including cigarettes containing something slightly less legal than tobacco! I even once went to a spiritualist healer but bottled out before I went in. In the face of the fact that nothing was going to work (or so I thought) I convinced myself that I wasn't bothered any more and became very lazy and unmotivated generally. Fast forward to June 2002, 7 months before I even knew Starfish existed. I went on holiday to Greece for 2 weeks and while I was there I began to realise how much of an uninspiring waste of time my life had become. I don't think you realise how much of a rut you're in until you leave it behind temporarily. I suddenly had all these plans to go travelling or to university. Me and my friend Chris even discussed how much of a great adventure it would be to buy a car in Greece and drive it home to England across Europe. Then I went home... ...And everything went back to "normal". And I still had my stammer that had always prevented me from following my dreams. Over the coming months it became impossible to pretend that everything was fine any more, and I sank deeper and deeper. By December 2002 I was on anti-depressants, and on Christmas Eve, after drinking half a bottle of gin, I broke down and everything came out. I realised that I had to act now to get my life back. After searching various websites, I came across the Starfish Project. I just got the feeling, subconsciously or otherwise, that this course was the one that would help me the most. It just somehow had a nicer, friendlier atmosphere. So, I filled in the on-line application form (I didn't even go near the phone in those days.) By now it was January 2003. I was still on the tablets but I felt a lot better now that I was taking some kind of action. Anne phoned me a few days later and told me that the earliest available place was in June, but that I was on standby in case anyone cancelled. I was still surprised when I arrived home one Wednesday afternoon in mid February after getting my bike fixed, to hear a message from Anne telling me to ring urgently. I was even more surprised when I was offered a place the following week. Of course I accepted. The course was wonderful. I felt I made massive strides in just one day, and by the end of the course I felt I could do anything. I won't go into the details of the course too much, as It's something that you have to experience for yourself. So on the Friday evening I headed for the North, and for home. Little did I realise that the journey home would be perhaps the most spiritual experience of the whole week. The weather was horrendous that night, wet, with a gale blowing, and the traffic was awful. By the time I reached Northamptonshire, I was literally starting to fall asleep at the wheel. So I decided to stay at the Travel Inn at Watford Gap for the night. I'd been crying while I was driving (don't know why), so my eyes were all bloodshot as I approached the receptionist to ask for a room. I must have looked a sight! As I was handed my key, I realised that I had just got through that conversation, not "fluently" as such, but without all the physical and mental struggle that I would have experienced in the past. That felt weird. What felt even more weird was going next door for my supper. This was the first time I'd been on my own, without all the people from the course. I felt so lonely, and that everyone was watching me! I ate up quick and hurried back to my room, watched a bit of telly, and went to sleep. You sometimes hear people talk about been reborn. Well, my moment of rebirth occurred in room 8 at the Travel Inn at Watford Gap at about 9am on Saturday March 1st 2003. I awoke from my slumber, and looked out of the window. It was then that I realised that it was indeed March 1st, which I always associate with being the start of Spring, and the end of the cold. As I checked out, I purposely got the attention of the receptionist even though I could have just put my key in a box. I told her where I had been and where I was going, and most importantly, who I was. She wished me good luck with everything, and as I stepped out into the open air and put my luggage back in the car, I felt that this is where my journey begins, and so it did. My name is Philip Baugh, and I am recovering from stammering. My story begins probably about 2 years ago now. 27 years old with no hope no future (as I could see) and wracked with shame and self hate. My stammer had taken control of me and my life completely and just seemed to get worse with each passing year. I had tried various therapies from slow-prolonged-speech to hypnosis, with no improvement. It was winter 2001, and I decided to search the internet for a cure to my problem, and I was not disappointed. There were indeed courses that offered a cure, and my deposit was in the post before you could say well anything would have taken a while to say back then, but you get the picture. That night I could not sleep. I was finally going to be cured of this plague upon my life, this leech that had drained me of all hope, confidence and self-respect was to be banished forever. It was then that I came across the Starfish Project, and I sent Anne Blight an e-mail, not asking if I could attend the course but what she could tell me about my potential cure as no other information on a cure could be found anywhere. Anne was (as ever) very diplomatic and gave me the number of Mr Richard Body who had attended both the Starfish Project and the course offering the cure. The advice that I received from Mr Body will be something that I will be eternally grateful for. Let us be clear, there is no cure for stammering. However it was made clear to me that with commitment and determination I could gain control over my speech. If I said that there was not a part of me that felt heartbroken I would be lying, but I realised that I did have a choice and an opportunity to make a change, if I so desired. Suffice to say I applied for the Starfish Project immediately, and was offered a place on the course the following April (2002). Whatever happened to my deposit for my cure? I do not know, I suppose it has been cashed and spent along with many more cheques that have been written by other vulnerable people, many of whom were not lucky enough to receive the advice that I did. The days leading up to my course I had slowly begun to make the conscious decision that this was going to be make or break. I was going to give this everything that I possibly could. I was going to work harder than I could ever imagine, because I wanted it that much. The course itself was fantastic. You may find this hard to believe if youre reading this thinking about attending, but there is nothing to be afraid of. You will never find a more understanding, warm and patient group of people. The course is run essentially by Anne Blight, however every month many recovering stammerers return not only to work on their own speech but to help run the course. The atmosphere on my course was amazing, and I am proud to say that it has been the same every time I have returned as a recovering stammerer. What I gained in those 3 days, were very simply the tools and support to control my speech and therefore control my life. However I do not see those 3 days as a course in itself, but merely as a 3 day introduction to a course that is going to last the rest of my life if I want it to. If I want it to? You may ask. Im not going to lie to you, recovering from stammering is one of the hardest things that anybody will ever do, however I have no doubt in my mind that it is worth it. Personally no matter how hard recovering from stammering is, it was always much harder to be a stammerer, with no control and no self respect. It has now been nearly 18 months since my first 3 days. My life has changed in ways that you could not imagine, and I am not going to go into detail now, youll have to wait for my autobiography for that. What I can say is that from a job that I hated and made me feel worthless, I now love what I do and the opportunities that come my way are not by luck, but are the opportunities created by somebody who has the confidence in himself and the pride in his recovery to take life head on. I will never give in. I have bad days really bad days, but nothing will ever stop me from doing what I have to do to move forward in my life. Yes, the Starfish Project has enabled me to control my speech in a way that I could never have dreamt of, but more importantly than that it has given me the self-belief that I can do anything that I set my mind to. It has given me self respect and pride, and some of the best friends I could wish for. Thank you everybody (you know who you are). Your continuing friendship and support mean the world to me. 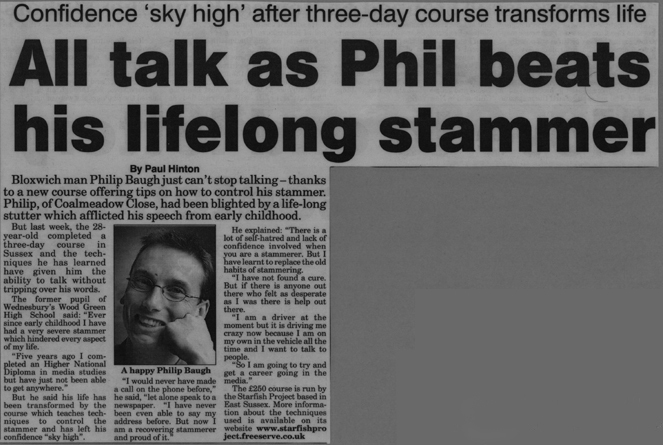 Please click here to read a newspaper article about Philip and his recovery from stammering. I cannot begin to thank you both enough for changing my whole outlook on life and on other people. The work you both do I think is nothing short of a miracle. I was in awe at the amount of passion you both have for the work you do. I have stammered all of my life. Going to school, getting a job, having a relationship with someone, all these things sadly have been an absolute nightmare. I've had speech therapy hypnosis and have also tried various relaxation therapies but all to no avail. So as you can imagine, going on the Starfish Project was just another one of these things I had to try, and I am so glad that I did. You have given me a "tool" that I can use, which believe me , really does work. You have also taught me that it doesn't matter what people think, and if they laugh or joke behind my back then they are not worth the air they breath, so "you treat them with the contempt they deserve". My friends and family cannot believe how good this course has been for me, and my husband just thinks its amazing, although I think he felt a bit redundant when I came home. We both went to Harrods in London after the course and it is something that I will never forget for the rest of my life. We both were looking for a certain department but couldn't find it anywhere, so I took it upon myself to go and ask someone (which my husband was totally oblivious to). You could imagine his surprise when he turned round to see his wife speaking with absolute confidence to a stranger. I think he got such a shock because he just burst into tears. I have never felt so proud and so emotional at the same time in all my life, and for this I thank you both from the bottom of my heart. You and all the people who come back on the course to help other people are truly, my inspiration. I will be phoning but also wished to record my gratitude and thanks in writing. You may remember that my daughter was getting married in Israel. I am just back from the wedding, which took place last week. As a stammerer my nightmare situation was meeting people for the first time, particularly in situations where a "good first impression" was important. Right from the first hours of arriving in Israel I was involved in many such situations (meeting Rabbis, in-laws, the groom, daughter's friends, wedding guests etc.). As a recovering stammerer I was able to deal with all these situations with confidence and speak (with really very few blocks) with a fluency I have never had - answering and asking questions and expressing my views and comments. This is a totally new experience for me and I know from my past experiences the agonies I would have suffered if I had not been on the Starfish course. My sincere and grateful thanks to you and all those involved in the Starfish Project for giving me back verbal communication and so increasing my self-esteem. Again THANK YOU (two small words which, certainly in this case, have a huge meaning). Our son Craig called at our house late this morning (Sat. 28th Oct ) and said "guess what - I am a recovering stammerer " - and from there the story of him finding your web site a few months ago to his three days in Sussex on the course came out. I am still absorbing this news which is the most fantastic, best & happiest of my life. Only Craig knows the full extent that his stammer has had on his life but I reckon to come second to knowing and seeing what a handicap it was. To hear him talk now has been more than I could have ever hoped for and added to that is his total enthusiasm for the course and all that you and others have done for him. I am so proud of him for his courage and iniatitive and his determination to return in order that he can help others. Words cannot truly express how I feel albeit that quite a few tears of joy have gone some way!. Many, many thanks and I hope that one day we may met with you. I hope you are both well and healthy and looking forward to the festive season. I just wanted to write a few notes to wish you both well for Christmas and to also put in writing a few long-overdue thank you's ! To look back and see what has happened over the last twelve months is very rewarding, my marriage in April being the culmination of a great year for me. In terms of my speech and my life in general things have gone very well ever since that trip down to Sussex at the start of the year. I have broken down a lot of the barriers that I thought would forever hold me back in my life, and now with my wife am beginning to plan the life I always wanted. None of this could have happened if it wasn't for Starfish. Whilst the technique helped me tremendously to regain control of my speech after an awful time in my life, it was my mental and psychological change that I attribute most to my time at Bosham. Before I undertook Starfish I had hidden my stammer from everyone bar my immediate family. By the end of the following week I had told nearly all my friends and basically everyone who I could in my office. I think that says it all. I went from being one of the most introverted stammerers that you'd meet to being an overt and honest recovering stammerer. My other bugbears especially answering the phone both at home and at work have also now been rectified by speaking more deeply and assertively. I can once again say that lovely word 'Hello' when I answer the phone. How good it feels ! Of course I still have my up's and down's and that is of course going to happen from time to time. These days though I adopt the Starfish philosophy 'Each time you fall off your bike, just get back on and start riding again'. It almost feels that the course has given me a protective shield around me that makes me feel whatever challenges I face during a day I can get through them and I will get through them. It's nice feeling more positive and not letting things get me down. Those hurdles just do not seem so high any more. My memories of the three days down in Sussex are of warmth and fun but also tough work and honesty from everyone. It was great to see such a great bunch of recovering stammerers discovering something so valuable as Starfish. No doubt you get to see a lot of lovely people every month - it must be rewarding I'm sure. I am also indebted to Paul Bond who as well as supporting me throughout the three days also gave me one of the original prototypes of Sonia's wonderful belts. He also continued to help me on the telephone in the weeks after the course. I hope to see him again some time and thank him personally. I respect him for what he's achieved since Starfish more than anyone else. A mention must also be given to the Phone List in general. It's a great platform for us all and an excellent creation for a lot of people who don't have that support when they leave Sussex. I got a lot of help from various people in the months following my course and I hope the list continues strong for a long time. Having admittedly neglected it for too long recently I'll be personally catching up with a few people very soon I hope. Starfish works because it is built on genuine warmth and love and a feeling that both of you really care about each and every person who arrive on the course each month. Indeed as far as I'm concerned the level that you truly care about all us recovering stammerers is unique in the field of speech therapy. I am particularly indebted to you for rushing me onto the January course when although you were very busy you understood and cared about the worries I had with speaking at my upcoming wedding. To me that was a lovely thing to do and I really appreciate it. The confidence I had standing at the altar can be directly attributed to Starfish. Those reasons and of course the technique and structure of the course itself is why Starfish is and will continue to be the way forward for all recovering stammerers in this country and indeed the world. Long may it continue. Looking ahead I am very much hoping I can make it back down to Sussex next year hopefully in the Spring. It's something I said I'd do this year but never was able to make it. I fully intend to try harder to return next year and hopefully pass on some of the rewarding things I have learnt to new recovering stammerers. In the meantime I continue to be part of the Starfish circle locally, attending the Essex group, well run by Barry Rix. I'm also continuing my path to Chartered Accountancy qualification and generally enjoying life in my little cottage here in rural Essex. Life is good at the moment and 2003 should be another year of challenges that I'm looking forward to facing. I end by once again saying a heartfelt thank you. I'll try and not leave it so long to communicate again next time. See you soon and have a lovely Christmas. Thank you for changing my life. It's been three months now since I attended the Starfish course, October 2001. Before then my stammer controlled my life, let me begin by telling you how. As a child being taken out of school to attend ineffective speech therapy, always feeling belittled by so called fluent people, feeling a let down to family and friends, feeling so ashamed for my inability to say what I wanted. People looking away as I spoke, not knowing how to handle it, watching me slapping my hand against my leg, stamping my foot, and contorting my mouth to incredible shapes, to try and say what I wanted. The feeling of been on my own, trapped with a condition that many other children found very amusing. My hate I would feel if anyone dare ask about my stammer or the total embarrassment when I heard the words "It's ashamed It's not his fault". Memories of reading out loud in class hearing other teenagers sniggering at my expense. My English oral exam, looking at the examiners looking at their watches and after, telling me I'd made a brave attempt. On leaving school came job interviews. The lack of sleep the night before praying that I would get through it without the interviewer noticing, but they always did. Getting that kind rejection letter afterwards never came as a shock. For 16 years I had a job where I didn't have to speak, trapped in a job I loathed. Then leaving to set up on my own, only to make Rachael (my wife) do all the telephoning for me. Thank the lord for fax machines. In 1989 I attended a course in Scotland, with high hopes that at last help was out there, because it claimed to offer a cure. Sorry once again I was left feeling useless. This amazing cure didn't cure me. It took me 12 years to decide to try again, having read the starfish website. Even then only by e-mail because on my lack in confidence on the telephone. When you rang back the next day I was so shocked to hear a LADY understand what I had gone though. Since October I have controlled my speech. The joy of saying what I want when I want is to great to comprehended, To be able to order using my switch card, tell people my phone number, name and address, and the biggest joy of all is feeling I'm equal to anyone else. The change in me is incredible; from being a negative person to becoming a very positive person is all down to you. No amount of thanks will ever be enough in my view. I'm in control of my stammer not it been in control of me. To have met two of the most genuine people I have had the privilege to meet has been an honour. 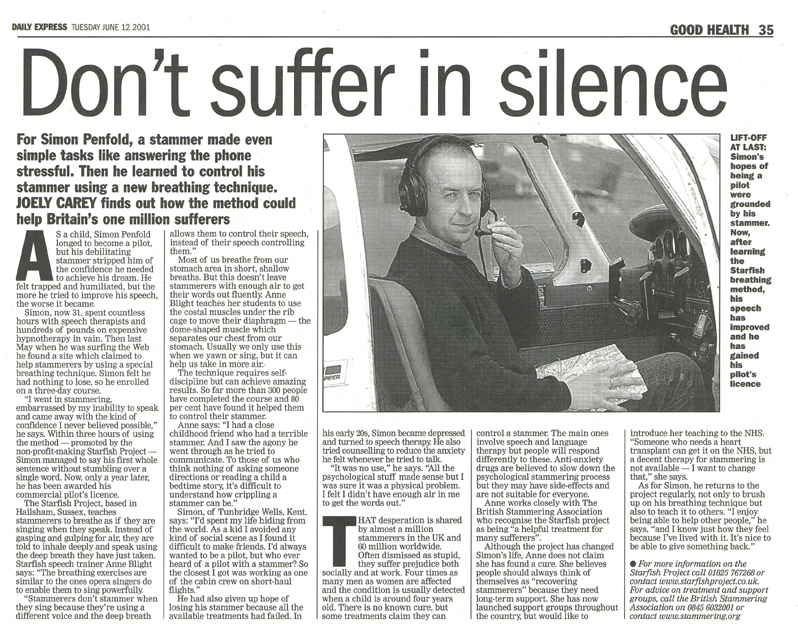 Please click below to read newspaper articles about Richard and his recovery from stammering. I just wanted to say THANK YOU, for helping my husband Richard Body. I was sceptical and very worried when Richard told me that he had contacted you and arranged a place on one of your courses. Many years ago, Richard went to Scotland on a course that promised to cure him of his stammer. Of course you know what the outcome was, no cure and Richard feeling extremely depressed and worthless. Richard told me that he had to give himself another chance and that he felt really at ease talking to you, as he felt that you really understood what he was going through. I needn't have worried. I will always remember the telephone call Richard made to me at home on his second night of the course. I couldn't believe my ears! Richard read his switch card number! Many people may not understand the significance of this. At work, at home in all situations, I was the one to make payments, calls, enquiries and complaints. This however was to become a thing of the past. Once back home, Richard COMPLETELY took over! His first task, the very next morning, was to go to the travel agents and book a holiday. The rest of the family had to learn not to answer the telephone; this was Richard's job. His next idea was an answer phone, as he had always wanted to record his own message. The family now had to learn to leave the telephone alone completely! We are all overjoyed for Richard and do not mind him taking over at all. It is however hard work for recovering stammerers. They have to put the work into practicing and are helped along the way by an amazing support list. Knowing that he is not on his own, being able to call friends on the list, and you is most helpful. Richard has made many lovely friends via the Starfish project, some I have spoken to, some I have met and I hope to meet many more when I go with Richard to your next course on the 23rd of this month. Once again Anne, and David, may I thank you both. Richard thinks that you are the most wonderful people and I look forward to meeting you very soon. I am writing to thank you for giving me the joy of Effortless Speech after suffering for 35 years as a stammerer. I could not begin to put into words the gratitude I feel and I know, being the person you are Anne, you would not want me to try. You already know! Instead I am going to try and explain how I felt whilst on the Starfish Course in November 2001. This will hopefully help to alleviate any fears people may have if they are contemplating contacting you. It was a huge decision for me to attend the course. After all, every other therapy I had tried over the years had not worked, so what made this course any different? I arrived with the attitude that if the technique helped, then great! If it didn't, it would not be the end of the world. I soon realised that it definitely would help, and for that I thank the other recovering stammerers who were in attendance to help. I won't name you all individually for fear I may miss somebody, but you all know who you are. You were (and still are) my inspiration! I always appeared confident with my stammer, in fact my favourite saying was "It's part of me - it never bothers me". Inside it was a completely different story. I felt insecure and unhappy a lot of the time because of course it did bother me. But I would never let that show. Apart from learning the technique itself, a huge start to my recovery as a stammerer was to leave 'old demons' behind. I discussed at great length how my stammer had affected certain parts of my life with people who had been through exactly the same as me. I found comfort from the fact that I wasn't the only one who had ever felt these emotions. At first I was embarrassed about letting my emotions flow so freely, but soon realised it didn't matter, in fact it helps. This was the place to do it because everybody totally understood how I felt. It was fabulous to cry at last and it was a great relief too. The Starfish course had changed me immeasurably. I no longer feel angry and frustrated about my speech or previous therapies. I feel calm and in control. Of course some days I will go 'off track' a little because after all we are only human and nobody's perfect. The difference now is that I have a 'tool' to work with which will enable me to get straight back 'on track' again. And believe me it really does! If anybody out there is thinking of attending the course and is sceptical, all I can say, from personal experience, is take the plunge and do it. You have to be totally committed and have to want to do it for yourself. Another important thing remember when considering attending Starfish is that, unlike other courses, this course is predominately for you as an individual. You don't have to do anything you feel uncomfortable with and you work at your own pace at all times. Go with a positive attitude and be prepared to work hard. JUST REMEMBER, YOU TOO CAN BECOME A RECOVERING STAMMERER, TRY IT, ITS GREAT! Thanks again Anne, you're a star! I write to you with regards to the Starfish Project, which my very good friend Julie Newhouse attended in late November of last year. After thinking long and hard, Julie decided that she would like to attend the project. I have always been behind Julie 100% when she has struggled in various and numerous circumstances, which, I may add, have been embarrassing and humiliating for her. After her return home, she came to see me, and was on an absolute "high". I have never seen her so confident and in control. Her opening words were "I am a recovering stammerer", to which I nearly fell off my chair. Never, have I ever thought that Julie could have said that to me, or anyone else. I sat most of the night with my mouth hanging open, watching closely, and not being able to believe she never stammered once. In the past Julie has always told me to finish her sentences off for her. Now I feel redundant, for all the right reasons, no longer being an interpreter or telephonist. Six years of speech therapy, trying hypnosis and alternative therapies had made no difference to Julie. This is why I decided to write this letter, as I believe the work that you do is truly amazing. Julie has benefited so much from the Project. After 30+ years of speech problems, I still find it unbelievable that three and a half days intensive therapy has changed not only Julies life, her families (and mine). Thank you for making my wish come true, I am proud to call myself a Recovering Stammerer. With all the support I got on the Starfish course the real me, which was behind the stammer has come out and I'm now a different person. Now I can finally say what I want to say, without having the fear of saying it, and that is a good feeling. I knew when I decided to come on the course I had to do it for me not for anyone else; I wanted to take control of my stammer, which was taking over my life. I needed to be positive and give it 100% commitment, which I did. I also had to focus on what I wanted to achieve on the course and it worked. I can say it was an amazing 3 days of my life doing the course it is something I will never forget. There was so much support from you, David and the rest of the group including the people who came back. I now see life in a different way; I see a future for me, which I couldnt see before because of my stammer. I'm looking forward to doing things I could only dream about, theres no stopping me now! I know there will be bad days but when that happens I know I will have the support from the phone list. I also just need to think back on the 3 great days, how far I've come and the fantastic people I've met which I can call friends that will help me handle any situation. I've now become strong and I am building up my confidence, which I had none of before I came on the Starfish course. When I went home that Friday my family and friends were amazed to see how much confidence I had in speaking, they could see my eyes lit up which they've haven't seen for a long time. At one point they couldnt shut me up it felt Excellent something I felt fear of doing before. If anyone else reads this letter and they are thinking of coming on the course, come with a positive altitude and have faith in your self and you will get through it like I did. You should also focus on what you want out of the course, one last thing I would say do it for you and when your ready don't let anyone push you in to it. I'M in Control and that is how its going to stay. Please click here to read newspaper articles about Rosalba and her recovery from stammering. Its been 7 weeks now since I attended the Starfish Project and like the story goes it has made a difference to that one - that one being me, not only me but also the rest of my family. The first day home after the course I phoned the hairdressers to make an appointment for my wife and I. I did not take the first available slot but one that suited me. I did not stammer once and when I came of the phone, my wife who was sitting listening, was so overcome with emotion she actually began to cry, she felt so proud of me making that call WOW! Anyone reading this with a stammer will know only too well what effect on our lives a stammer has and how we learn to avoid or change talking situations, only to find the next one twice as bad. The help I received from the Starfish Project is immeasurable, its no magic cure but a sure route on the road to recovery from stammering. The work is not easy and the course intensive but its also great fun and in a superb setting, with the chance of making new friends for the future. The course lasted 3 days but the back up lasts forever. Starfish has helped me and if you would like the chance to become a recovering stammerer please give Anne a call, I can guarantee it will be the best call you could make. Still not sure then why not phone me and talk to a recovering stammerer, I would be more than happy to answer any questions or worries you may have. Please click here to read newspaper articles about Craig and his recovery from stammering. Many, many thanks for all I have received from attending one of your Starfish Project courses. The course itself was a fantastic breakthrough for me to control my stammer and the support from yourself and support group has been has been equally beneficial. At last I have been given the 'tools' to control my stammer and have confidence in using them.To undertake the Commercial Pilots course I am now on would have been near on impossible before but through all you have done and a lot of determination I am getting on very well with my studies. The only way now is onwards and upwards!! Since writing this letter Simon has gone on to successfully complete his training and is now a fully fledged commercial pilot. Well done Captain Penfold we are all very proud of you. Please click here to read newspaper articles about Simon and his recovery from stammering. My name is Kirsty Maguire and for as long as I can remember my stammer has controlled and dominated my entire life, more than you can ever comprehend. To me my stammer was a horrible feeling that lived in my throat and tongue, and fed and thrived off of my negative attitude, bad experiences, self-hate and shame. At school I was subjected to years of torment and teasing because of my stammer. In the worst instance I came home with bruises on my body after being punched by boys. And why? All because I couldn't speak properly. Thankfully the bullying died down in the last year of school, they accepted that I was a stammerer and found someone else to pick on. Even the teachers didn't make it easy for me. One teacher would start at the front of the class asking us to read out loud, slowly working her way up to the back of the class where I sat. This would always give me plenty of time to work myself into a nervous wreck. Sweating, palpitations, heart pounding and short shallow breathing, making it impossible for me to speak. After I had struggled through my short paragraph, which seemed like an essay I was left feeling totally stupid and ashamed. I loathed myself, if only she had known how I felt. After I left school things didn't get any easier, in fact, they got harder. I had some really challenging situations to look forward to, like shopping for insurance, ringing up for job interviews, activating bankcards. I did none of it however; I got my mother to do it for me. My first job was in a hot, dirty factory. It seemed perfect; I didn't need to talk to do my job. It wasn't perfect though, I hated it! I knew I was capable of more. Instead I went in and out of jobs I hated. This made me very unhappy as I had lost hope of doing my dream job of being a Fire Fighter. I was convinced the nearest I would get to putting out a fire would be blowing out a match! So as the years went by so the more it got to me. Even saying my own name was a major tribulation. So I tried to avoid the whole speech thing altogether, avoiding situations that I knew were impossible. I didn't was to make an idiot out of myself. I didn't want people to hear and see how ridiculous I looked and sounded when I stammered. Anyway, what hope was there for a gibbering idiot who couldn't even say their own name? So in desperation I went on to the Internet and came across The Starfish Project. I enrolled to attend a three-day intensive therapy course in Sussex. It was there that I learned to control my stammer by combining my speech with a "costal breath", the breath you use when you sing. I was also taught how to use the power of positive thinking. On the third day of the course we were given the chance to put the technique to the test, to step out of the comfort zone and break the habit of stammering in the local shopping centre, with help and support taking things step by step. The three days were very emotional for me and everyone else, but I can honestly say that they were the best few days that I have had for a very long time. I left Hailsham with a strange feeling of confidence. It was like a huge weight had been lifted off of my shoulders. I had finally found the strength to knock down the walls that had held me captive for all those years. Nowadays, I deliberately put myself into situations that I would have avoided before. If I go to stammer I just tell them that I am a recovering stammerer, exhale, focus and take a deep breath and start again. The road to recovery is rocky and I remind myself regularly that I am breaking the habit of a lifetime. I know I will never be fluent, just controlled, and that's good enough for me. I now feel proud when I tell people that I am a recovering stammerer.It gives me a buzz because I can talk about something I have kept in the closet for so long. My next aim is to be accepted into the selection process for the Fire Brigade. The Starfish Project has helped me change my life. Please click here to read newspaper articles about Kirsty and her recovery from stammering. I've been home for just under a week now, following my first Starfish course, and I can honestly say that the past few days spent communicating with loved ones and work colleagues have been nothing short of miraculous. On the second night of the course I telephoned my wife Sonia, and she couldn't believe the change in me! We laughed, cried and talked in a way that we've never done before. It felt like I'd suddenly had a massive burden lifted from my shoulders. Up until the course I was tired. Tired of life, tired of struggling, and weary of the mental turmoil that I had to go through each time I set foot outside the front door. Sometimes it is difficult to maintain control and to keep plugging away with the breathing technique, which you taught me how to use so well, but I have no choice. I'm not prepared to go back to being a stammerer who's afraid of life and afraid of avoiding most of what the outside world has to offer. My name is Paul Bond and I am a recovering stammerer. You have taught me not to be afraid, to break through those mental barriers, and to push on towards the ultimate goal that is 'the joy of effortless speech'. I will not be silent any longer. With your help I have 'rediscovered' my voice and have experienced a complete turnaround in my personality. I am happy, have a positive outlook, and if someone makes a comment on the 'costal belt', which I so proudly sport these days, I just don't care. I'm past worrying about how I'm perceived. The only thing that I really focus on now is breathing, speaking slowly, and telling the people around me who care for me how much they mean to me. I don't avoid or write notes or run from the telephone like I used to. These days I tackle things head on, and if I stumble I just pick myself up, dust myself off, and say, "you'll have to do better than that next time Paul". Thank you so very, very much for making my dream of thirty years become a reality. The Starfish course really is the key that unlocks the communicative prison door and sets the stammerer free. Words are not enough to express my gratitude, but then again they are aren't they Anne! Very best wishes from Paul. Paul has since spoken for twenty minutes in a BBC Radio York programme about Stammering and his recovery, this resulted in the BBC inviting Paul to read the bulletins in between the programmes for a whole day.